Sustainability has emerged as a central issue for contemporary societies and for the world community as a whole. Furthermore, many of the social and environmental concerns that are embodied in the term 'sustainability' are directly or indirectly related to design. Designers help to define our human made environment - how it is produced, how it is used, and how long it endures. Despite some forty years of development and increased awareness of the critical relationships that exist between design decisions and modes of production, energy use, environmental impacts, the nature of work and human exploitation, design for sustainability is still not widely understood or followed. The Handbook of Design for Sustainability presents a comprehensive, state-of-the-art overview of this crucial subject - its development, its methods, its practices and its potential futures. Bringing together leading international scholars and new researchers to provide a substantive insight into the latest thinking and research within the field, The Handbook covers a breadth of historical and theoretical understandings and includes a series of original essays that explore methods and approaches for designers and design educators. The Handbook presents the first systematic overview of the subject that, in addition to methods and examples, includes historical perspectives, philosophical approaches, business analyses, educational insights and emerging thinking. It is an invaluable resource for design researchers and students as well as design practitioners and private and public sector organizations wishing to develop more sustainable directions. 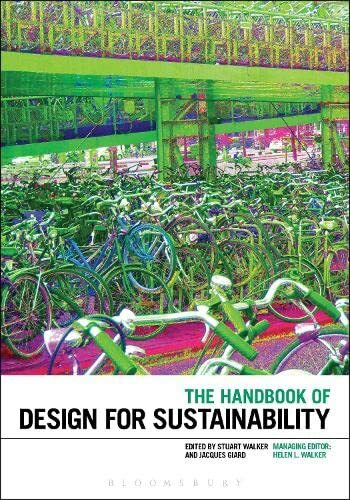 The first devoted overview to the field, The Handbook of Design for Sustainability is the authoratative text on sustainable design. Stuart Walker is Head of Design, Co-Director of the ImaginationLancaster creative research lab and Professor of Sustainable Design at Lancaster University. He is also Visiting Professor of Sustainable Design at Kingston University, UK and Adjunct Professor at the Faculty of Environmental Design, University of Calgary, Canada. His propositional designs have been exhibited at the Design Museum, London, across Canada and in Italy. His books include The Spirit of Design: objects, environment and meaning and Sustainable by Design: explorations in theory and practice. Jacques Giard is Professor of Industrial Design in The Design School at Arizona State University, prior to which he was Director of the School of Industrial Design at Carleton University in Ottawa, Canada. He is the author of Design FAQs, a university textbook on basic design and Designing: A Journey Through Time. He has also served as national president of the Association of Canadian Industrial Designers. Helen L. Walker is an independent language consultant with an MA in Education for Sustainability.